It's the weekend and you are itching to grab some friends, have a few drinks, and sing your heart out. Now the problem is finding a great karaoke bar when you are visiting a new area or perhaps thinking about trying something different. In Nevada there are some fun and unique places to try the next time you are ready to belt our your own version of your favorite show tune or throwback hit! This is the ultimate in karaoke with private booths to enjoy a more intimate experience. This is a safe bet for travelers from all over since they also offer many of their songs in a variety of languages. If you are looking for a late night spot in Vegas, this is a great place to grab a bite to eat at the end of the night and belt out a few songs. The fusion menu offers a fun twist on bar food and there is always a fun crowd for late nights. They also offer several party and special event options for groups. Only in Vegas will you find a gay-friendly song spot where once a week they host an underwear karaoke night. While they have karaoke several nights a week, this is by far their most popular event. It's something different in an welcoming and open environment. This is the locals' hang out for fun karaoke in Reno. While they seem to be a tight knit group of regulars, there are also a wide range of newbies to mix things up. The song choices and equipment is pretty standard but the relaxed environment is nice. Late nights are made for this lounge type club and your best Vegas rock star impression. The bar offers more of a club like approach to karaoke with some great late night eats as well. They do get very busy to make reservations! Kind of a combination of old school Vegas and a “Cheers” type bar, the dark interior of the bar gives this place w very different vibe than many other typical son bars. This seems like the perfect type of place to sing some throw back grunge rock and drink whiskey on the rocks. Open from 6 p.m. to 5 a.m. every night, this is the place to kick off or end your night out on the town. They have four different types of song suites so they can accommodate groups from just a few friends up to 25-plus people in a private room. Each suite is comfy and well stocked with thousands of songs. This live music venue offers karaoke nightly and the fact that they have a big stage real artists use only adds to the fun. They also make some of the best burgers in town. Because they also hose live music, many groups like to make it a night of a show and then putting on a show of their own. A more intimate venue for karaoke, this is karaoke like it all started. Plenty of beers on tap to give you the courage to sing in front of a bar full of strangers. They focus on the larger bar experience instead of private suites so this is also great for bigger parties. 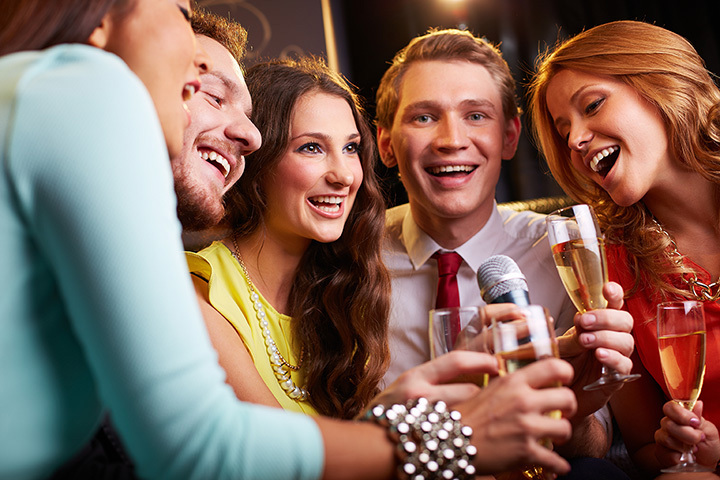 With a live band to back you up, this is a loud, party atmosphere to try your hand at karaoke. They host many tribute bands and their own local artists several nights a week with karaoke afterwards. What makes this place unique is that fact that the live band is at the center of everything, there isn't a bad seat in the house.